Need a convenient car scratch repair service? 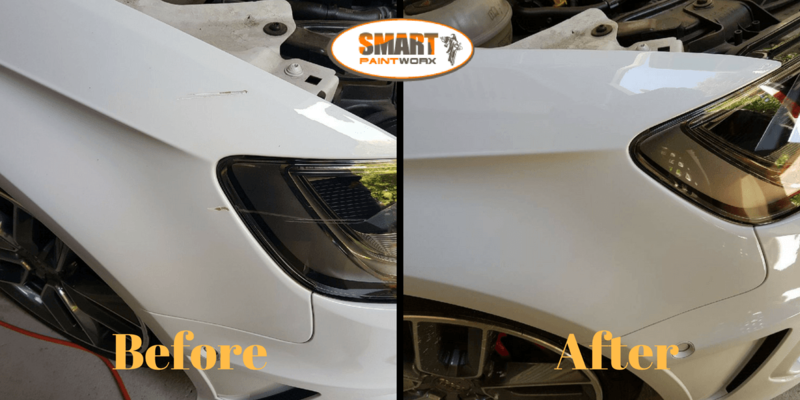 If you do need a convenient car scratch repair …SMART Paintworx can have your panel scratch fixed in just a couple of hours AND we are a mobile service..
WE COME TO YOU. Now thats convenience! Why take your car to a panel shop for days when it so easy with SMART Paintworx. Our friendly, fully qualified & skilled technicians can come to all Adelaide & surrounding suburbs to repair your car scratch. In as little as TWO hours we can have your vehicle looking like new again. We guarantee all our repairs for two years & just know you will be happy with the standard of repairs. One of our helpful staff will contact you with a quote on your repair & schedule a time with you. Generally we can have you booked in for your repairs within the week or two depending on workload. Our technicians will check the paint code of your vehicle when they arrive, in their vans they are equip with a computer system that will give them the ‘recipe’ to make your vehicles colour. The paint is mixed then & there ready to go on your vehicle. The process is quite straight forward involving sanding back the damaged area, a small amount of filler will be used if required, the area will be prepped & then resprayed following with a clear coat & a polish. The vehicle will be ready to drive once the technician has completed the job. We do recommend to not wash the vehicle for 24-48 hours after repair. Now that is a convenient car scratch repair ….. Some colours will require extra blending & will incur an extra fee from the standard colours. Colours that will require extra time are: Pearlescent white, Silver, Greys & not as common colours such as yellow, orange, pinks etc. This entry was posted in Convenient Car Scratch Repair and tagged car scratches, mobile scratch repairs. Bookmark the permalink.